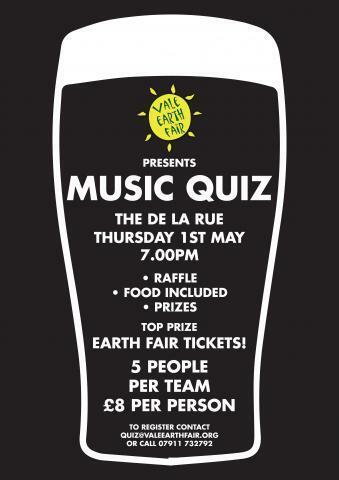 On Thursday 1st May is the hugely popular annual Vale Earth Fair Music Quiz which takes place at the De La Rue, starting at 7pm. Tables are going fast, so if you want to join in the fun you need to register by email to quiz@valeearthfair.org, or call 07911 732792. The entry fee is £8 per person for teams of five, and food is included. First prize is a Vale Earth Fair ticket for each of the winning team, and there will also be a raffle with various prizes.